Heat the rosemary and cream in a pan. Remove the pan from the heat, cover and allow to infuse for approx. 15 mins. Strain the cream into a bowl, refrigerate. For the decoration, shave flat, thin shavings from the chocolate using a large knife, cover and refrigerate. Break the rest of the chocolate up in a thin-sided bowl. Beat the egg whites with the salt until stiff. Add the sugar and continue beating until the egg whites turn glossy. Pour the double cream into the rosemary cream and beat together until stiff. Whisk the egg yolks and sugar in a bowl until the mixture becomes lighter in colour. Suspend the bowl containing the chocolate over a gently simmering bain-marie; it must not touch the water. Melt the chocolate, stir into the egg & sugar mixture along with 1/3 of the whipped cream. Carefully and gradually fold the remaining cream and the beaten egg whites into the chocolate mixture using a rubber spatula Divide the New Year mousse into glasses. Cover the dessert and leave to chill for approx. 4 hrs. Place the kumquats in a wide-bottomed pan, just cover with water and bring to the boil. Reduce the heat, simmer for approx. 5 mins. Drain the kumquats well. Bring the water and sugar to the boil, add the kumquat slices and simmer over a medium heat for approx. 5 mins. until translucent, drain well. Place the kumquat slices on a rack and allow to drain for approx. 30 mins. Leave to dry out for approx. 3 hrs. at 50°C in a (convection) oven with the door slightly ajar. Remove from the oven and allow to cool on the rack, dry. 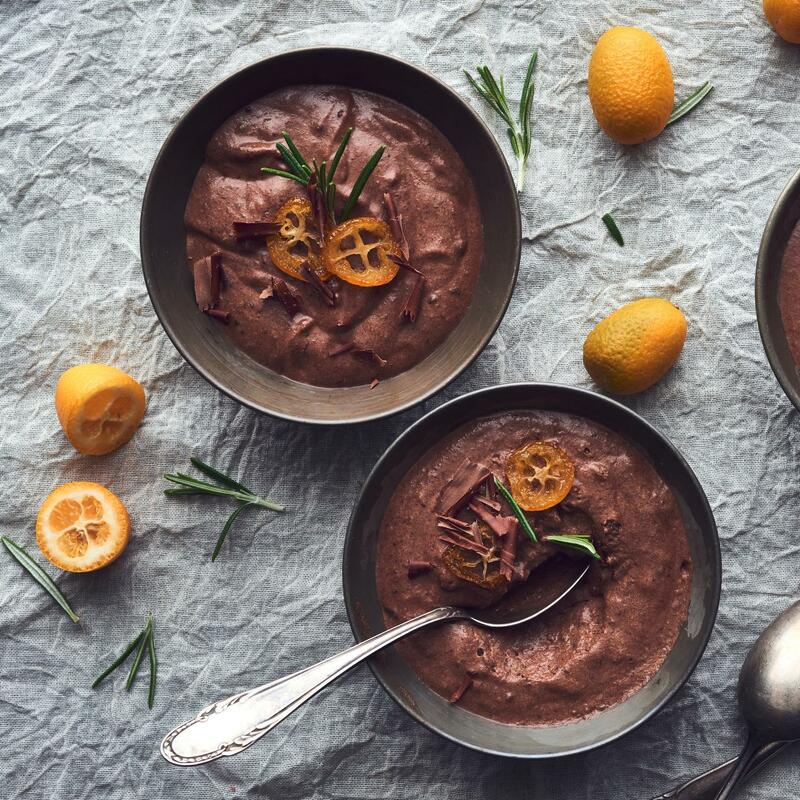 Decorate the mousse with the kumquat crisps, chilled chocolate shavings and rosemary. Prepare the kumquat crisps 3-4 days in advance. Keep cool and dry in a well-sealed tin in the fridge.